Hey y'all! Mandee from The Kitchen Wife coming at you again from Wild Wonderful West Virginia! Its summer, and bathing suit season is here. If you are anything like me, you are trying to eat a little lighter and healthier. But you don't have to give up filling and flavorful. Take my Southwest Quinoa Bowl for example. To begin you will need to prepare your quinoa. Add 2 cups of water to your pot and bring to a boil. Once the water it boiling, add the quinoa. You don't want dull quinoa, so we are going to infuse it with TONS of flavor while cooking! Let it simmer for 20 minutes, until all the water has been absorbed, and the quinoa is fluffy. Look at that! So delicious and so full of great protein! Now comes the fun part! Time to assemble your bowl. Place about a cup of the quinoa in the bottom of the bowl. Then add the toppings that you want! 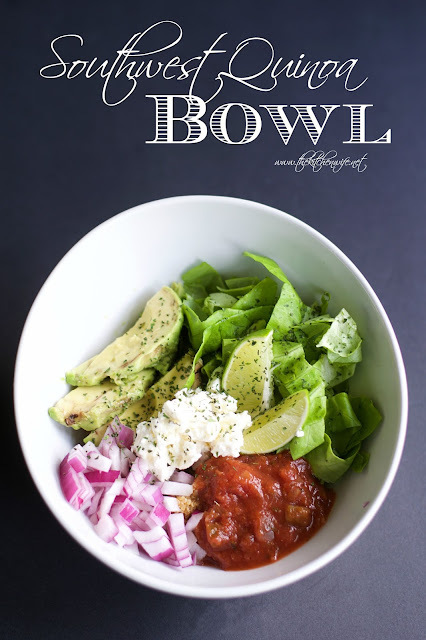 I like to top mine with lettuce (I prefer bib, but any kind will work), avocado, salsa, red onion, lime, feta, and cilantro! However, you could add beans, corn, and cheddar and totally make it a taco bowl! The possibilities are endless. I actually enjoy this just as much cold as I do hot, so it is perfect to pack for lunch, and what a interactive way to get more veggies into your child's diet! Want to beef this up a little bit you can add some grill chicken or taco meat. You can put it in a wrap for a burrito, in a taco shell for veggie tacos, I can't think of a more versatile meal. 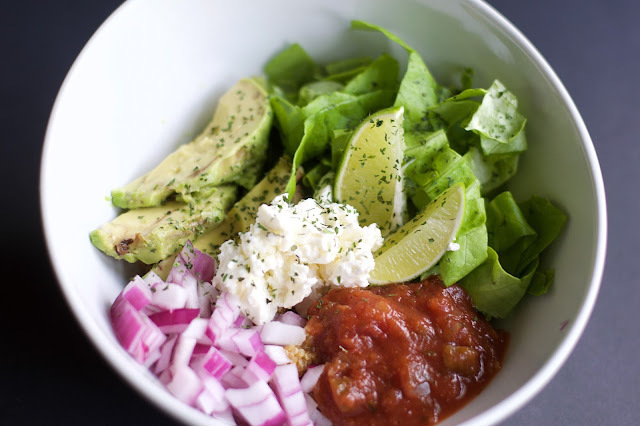 So get in the kitchen and give my Southwest Quinoa Bowl a try tonight! A fresh and healthy summer bowl, packed with protein and flavor. Prepare the quinoa according to the directions on the package. To the cooking quinoa add the chili powder, cumin, garlic powder, salt, and pepper. Once the quinoa has finished cooking, and all the water is absorbed, add a cup of it to the bottom of the bowl. *You can add grilled chicken or taco meat to this for bulk. **You can serve this in burrito form, or as tacos as well.